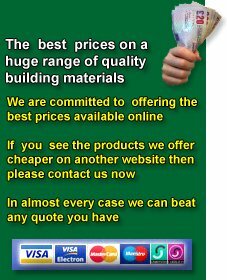 Building Materials Direct supply a huge range of Building Chemicals for use in many different building applications the range includes Mortar Plasticisor, Rapid Hardener for concrete, Mortar Frostproofer, PVA Adhesive and bonding agent, Mortar Waterproofer, Cement Dyes, Brickwork Waterseal, Block Paving Sealer and Bitumen Waterproofer along with all other Building Chemicals you might need for your DIY or Selfbuild project. One of the key elements when building a property is choosing the correct windows, doors and stairs to give the property that finishing touch. Building Materials Direct are able to supply a large range of joinery products from standard pressed panel doors to solid purpose made oak doors along with a variety of different style and finish windows and standard or purpose made staircases. Please note some of these products can take up to 12 weeks for manufacture so its always good to think about them at the start of your project. Building Materials Direct Have a supply agreement with one of the countries largest civil building supplies companies and as such are able to supply all of your groundwork needs from concrete kerbs, Cast Iron and Ductile Inspection chamber covers, Underground Drainage, Ductpipe, pressure pipe and fittings right through to concrete pipe and concrete chamber ring sections. Basically anything you require Building Materials Direct should be able to source it for you. Building Materials Direct are able to supply a large range of Builders Fixings including stainless steel walllties in either 200mm 225mm and 250mm long these can be ordered with insulation retaining discs also if required. Stainless steel wall starter kits in 2.4m packs are also in stock these along with screws,nuts & bolts, rawlbolts, hammer in screw fixings and nails available in many different sizes and finishes make up some of the Building Materials Direct Fixing range. Due to the massive range of products available in the Building Supplies Market we are unable to list every single product that we can source for you.